The PacWrap Model 1420LS-O Sealer Offers Superior Sealing Time after Time! PacWrap L-Sealers Feature 100% Solid State Electronics. So, the 10,000th seal is exactly the same as the first, regardless of the operator. Plus, the element wires last much longer and don't need to be changed as often, saving you time and money. Perfect for wrapping such items as: books, manuals, paper reams, toys and games, food products, software, magazines, audio and video cassettes, cosmetics and more. We use American-made, ultrahigh-amp solid-state relays; not flimsy printed circuit boards or old-fashioned mechanical contractors with spring to break down or contact points that require cleaning. Our heavy-duty solid-state relays, electronic temperature compensation, and oversized USA-made components combine to provide the highest level of electronic dependability available at any price . . . period. Using the 1420 LS-O with your existing tunnel or heat guns gives you an economical way to increase production. 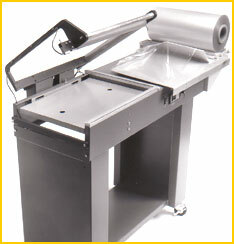 Fully adjustable film rack and separator allows various package sizes to be sealed without changing the film roll. 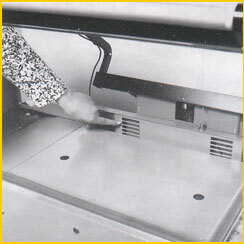 Accommodates 6" to 18" wide film rolls. Electronic digital temperature compensation makes perfect seals regardless of the operator's skill level. Everybody is a success with the 1420 LS-O. Adjustable volume control for sealing-cycle audio buzzer. 10" sealing length extension (for sealing packages up to 14" wide x 30" long x 71/2" high). Sturdy stand with shelf and casters.